Peacocks! They're so beautiful! To us humans, anyway. Are they beautiful to peahens? But that didn't stop him from thinking about peacocks and their feathers. In fact, thinking about it led him to the idea of sexual selection, a step beyond natural selection of his first book, "The Origin of Species," published in 1859. Where shall we go next with this discussion? I think I'll look at the way Darwin himself made his decision about whether to marry or not. Maybe the post after that will discuss the way Darwin and his contemporaries viewed women; and maybe next will be the misrepresentation of Darwinian theory by our own contemporary anti-evolution writers. After that, I don't know yet. 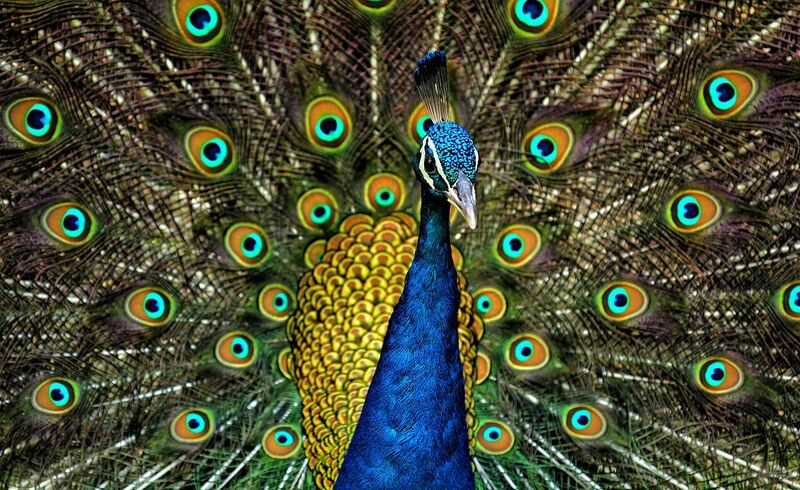 They must be, according to Darwin, although he also wrote, in 1860, "The sight of a feather in a peacock's tail, whenever I gaze at it, makes me sick." You can't really explain the evolution of peacocks' tails with the theory of natural selection, because those tails make it impossible for peacocks to escape predators, meaning the fittest would be the ones with the shortest tails. So what is left to explain this trait (and many others, found in many other animals, that don't seem to advance survival of an individual or a species )? He concluded, “We must suppose [that peahens] admire [the] peacock’s tail, as much as we do." Therefore, if the longer tails are considered more beautiful by the peahens, they are inclined to let the longer-tailed beauties mate with them, and thus their offspring will tend to have longer tails and be more beautiful, too, and so they'll survive, pass those long-tail genes to their offspring, and so on. This seems obvious to us now, but it was not obvious at all to his Victorian contemporaries, not even to the scientists. And it's still not obvious to everyone, not even to our own contemporary scientists. In fact, a fairly recent (2011) study found that it's not only the length of the peacock's tail that entices the peahen; there are other factors, including the number of "eyes" in the tail and the tail's symmetry, that the peahen considers in her acceptance or rejection of a suitor. This study isn't the only one that has been conducted on what helps a peahen make her decision; the back-and-forth between the scientists conducting these studies is a fascinating study in itself of how scientific dialogue should be conducted. The author of the 2011 paper cited above concluded, ""At the end of the day, we will never know what peahens are looking at and how they select their mates. You can't ask them." And there's the rub. You can't ask them. In fact, you can't even ask humans what are the "true" reasons behind most of the decisions they make ranging from everyday matters to whom they marry and their career choices. How did "beauty" evolve, then? We don't really know. Darwin was way ahead of his time when he suggested that beauty had anything to do with mate selection. He is still way ahead of OUR time, too, because many scientists with a purely mechanistic view of the animal kingdom are reluctant to admit that aesthetics have anything to do with evolution. I recall a study where scientists experimented with digital mashups of human faces to see if they could figure out what caused an assessment of "beautiful." They showed a range of options to college students of both sexes and asked them to rank them. They concluded rather lamely that "symmetry" had something to do with it (duhhh... guess I'll have to snip the top off of my one Elf ear). But they ALSO concluded that a face that represented an *average* that people were used to living around might be even more important. Here's a thought: more than one or two traits are associated with a single gene change: breeding Siberian foxes for being social with humans also gave the foxes multi-colored coats... not so good for camoflage in the wild, but appealing to their human masters. Perhaps the peahens were picking up on something - maybe an odor associated with many "eyes" in the feathers - or something else not obvious to a human. Heqq, even humans can't really explain what/why they find (something) attractive. The point here is that it is probably not just one thing that leads to selection.